In June 2017 after Bellator NYC, Chael Sonnen told a pool of reporters that he thinks he’ll cross paths with Fedor Emelianenko sooner or later. 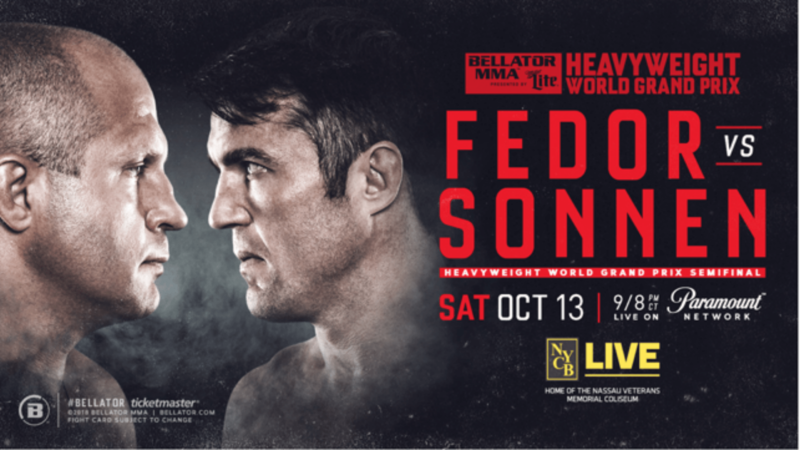 Well, that time is upon us, as Sonnen faces Emelianenko in a heavyweight grand prix semifinal bout at NYCB Live in Uniondale, New York, on Saturday, Oct. 13. The victor will face the winner of the Ryan Bader-Matt Mitrione fight from Bellator 207 the day before. Sonnen recently referred to Fedor as his “most dangerous” opponent yet, while speaking with Sporting News as part of a media conference call. Sonnen (31-15-1) advanced to the grand prix semifinal after defeating Quinton “Rampage” Jackson via unanimous decision at Bellator 192 in January. Emelianenko (37-5-1 NC) secured his spot in the semifinal after scoring a first-round TKO of Frank Mir at Bellator 198 in April. Here’s everything you need to know about Bellator 208. The entire Bellator 208 fight card is streaming on DAZN, beginning at 7 p.m. ET, and the main card airs on Paramount Network.